On August 15, 1914, the Panama Canal opened to cargo traffic. The Panama Canal, above, revolutionized shipping when it was completed in 1914. Before the canal neatly separated the continents of North America and South America through the narrow isthmus of Panama, voyages from San Francisco to New York took about three months. Today, more than 14,000 ships cut that time in half by passing through the canal every year. On August 15, 1914, the Panama Canal opened to cargo traffic. The Panama Canal is a 77-kilometer (48-mile) waterway that cuts through the narrow Isthmus of Panama. The Isthmus of Panama separates the Pacific Ocean from the Caribbean Sea. Construction of the Panama Canal greatly shortened the route ships traveled when voyaging around the world. Before the Panama Canal was constructed, ships had to travel around the entire continent of South America in order to get from the Pacific to the Atlantic Ocean. A trip from San Francisco to New York City was about 22,530 kilometers (14,000 miles). 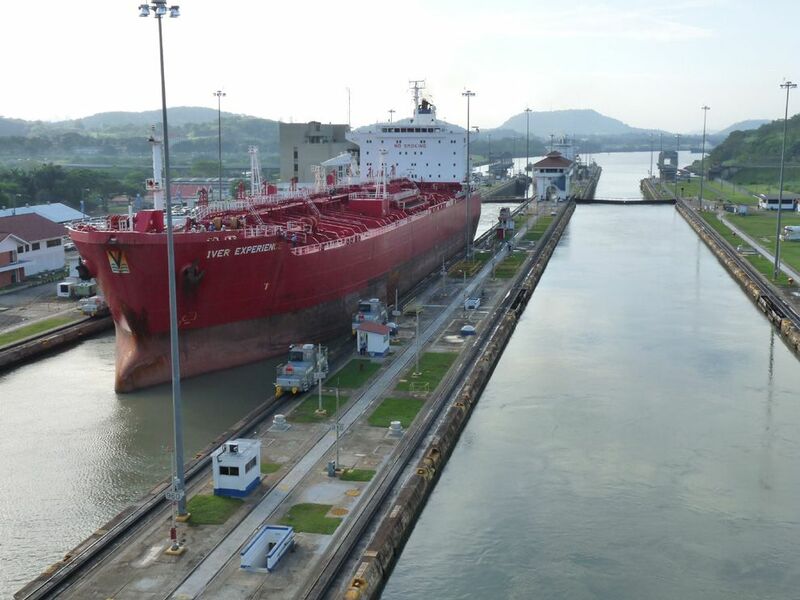 The Panama Canal shortened that trip by more than half, to 9,495 kilometers (5,900 miles). Today, the Panama Canal remains one of the world’s busiest and most lucrative shipping routes. Between 13,000-14,000 ships use the canal each year. Those ships represent 5 percent of all world trade. narrow strip of land connecting two larger land masses.